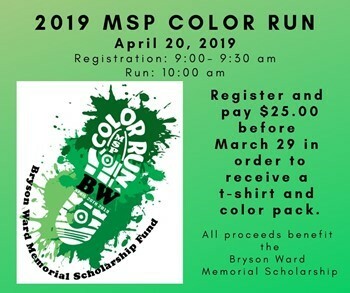 The Bryson Ward Scholarship Color Run will be held at MSP on Saturday, April 20th. Register and pay $25 by March 29, 2019, to guarantee you receive a T-shirt, individual color pack, and sunglasses. Registration will be open until the time of the race. To register, click on the link below or use one of the registration forms are located outside the library doors. A yard sale will also be held the same day. Proceeds will go to the Bryson Ward Memorial Scholarship Fund.